In case of multinational companies a BW system serves as global system. This means users are using it around a clock depending on their time zones. To support different loading times to satisfy user communities from different systems it makes sense to put the system time zone to UTC (Coordinated Universal Time). This time zone then serves as base time zone from which loads for different user communities can be derived. However more important is impact on BW system while time zone change. There are multiple places in the BW system that might be impacted by this. Therefore on such an event the BW system as whole must be carefully checked. Also all BW applications (InfoAreas) must be checked as well. 3. Loads notification delays – in case there is a workflow in place that notifies user about progress of loads. In case email/sms that must arrive on time and that time might change by the time zone shift.. Similarly to possibility to repeat DTP in case its previous run failed that I described here – it is also possible to enable in similar way repetition of step within process chain. A kind of automatic re-start of failed steps in the PC thing. This helps to improvements running of the PC and overall maintenance effort of SAP BW systems. 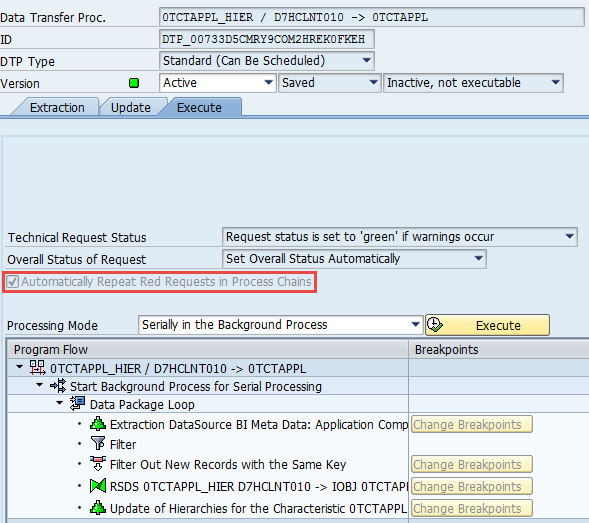 Normally in case the process step fails someone must go process chain log via Administration t-codes and manually restart the step. If certain settings are maintained for the process then after it failed depending on the settings automatic repeat of process chain steps happens. Seconds: a time in seconds is specified here how long the process needs to wait before repeating the task. After maintain the settings the PC must be activated in order to enable this feature. 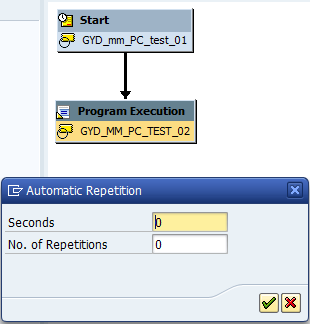 Technically the settings are implemented in table RSPCCHAIN and its fields AUTO_REPEAT and REPEAT_TRIALS. Within DTP there is a new flag available on Execute tab. It is called “Automatically Repeat Red Requests in Process Chains”. This feature helps to speed up administration of BW system. Imagine a case if the flag is NOT set and the DTP terminates. Normally an error message appears explaining that no new request can be started until the previous request is either repaired or deleted. 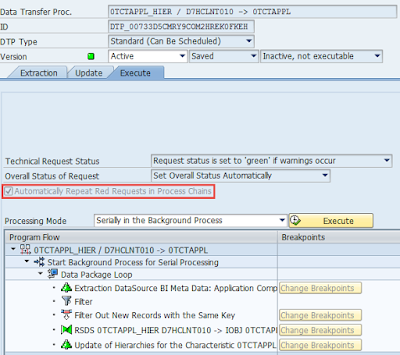 Now if the flag IS set the previous request that contains errors is automatically deleted and a new one is started. Technically the flag is implemented in table RSBKDTP and its field AUTORESTART. Data dictionary domain behind is RSBKAUTORESTART - DTP Request: Automatic Repetition of Terminated Request. In order to decouple of application logic used in BW’s Transformation ABAP code is sometimes not placed into the Transformation’s Start/End Routine directly but instead this an ABAP INCLUDE is used. So custom logic is complete placed into the INCLUDE that is included in the particular routine. 1. 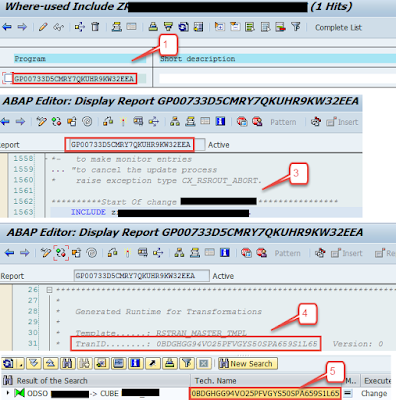 Display INCLUDE in t-code SE38 and perform either Where-Used function (CTR:+SHIFT+F3 or icon on toolbar) or syntax check shows a list of GP* programs where the ABAP INCLUDE is used. 2. Particular GP* program shall be looked up in table RSTRAN in field TRANPROG. Notice that has to be the GP* program ID used but w/o prefix of GP. In field of TRANID field an ID of Transformation is then found. 3. Display the GP* program in t-code SE38. 5. Take Tran ID information and use Find function of RSA1 to find a particular Transformation. It is an often case that an process variant within process chain is created but later on for whatever reason it is not needed anymore. The process variant should be deleted in such a case. So how to delete an old process variant that is not needed? Basically within t-code RSPC1 (or via RSA1 -> Modeling -> Process Chain) any PC needs to be displayed in the PC maintenance mode. Then depending on Process Type of process that needs to be deleted such a Process Type needs to be found within the displayed PC. 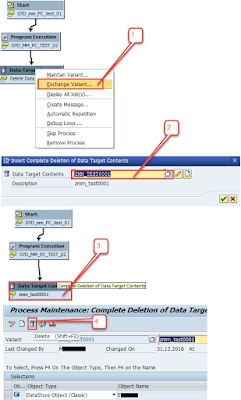 This is a short post about how to find out a data deletion related logs in SAP BW. 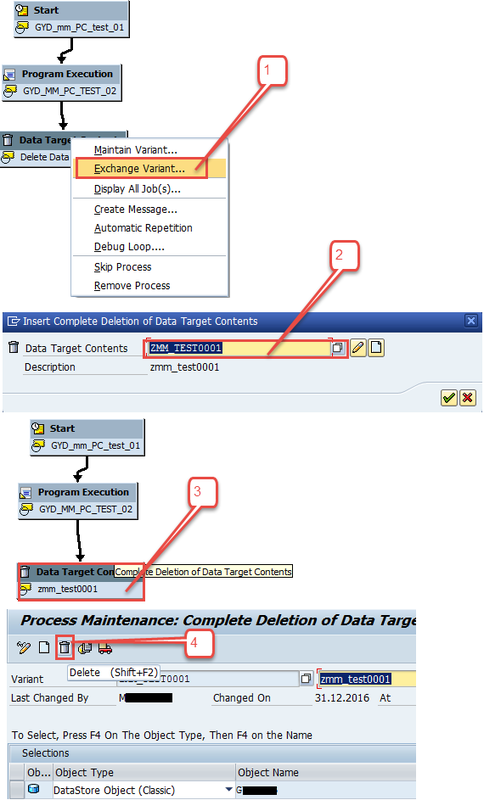 Mostly details about data deletion operations that happened can be revealed by t-code SLG1.